After 4 years of war, Speedway owner Capt. 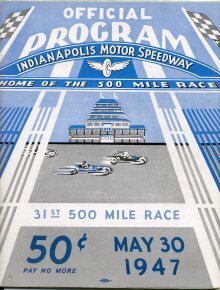 Eddie Rickenbacker had other ventures he wished to pursue so he expressed a desire to sell the Speedway. Three time ‘500’ winner Wilbur Shaw didn't want to see the Speedway go the way of a housing development, so he looked for interested buyers who would preserve the Speedway. He found such a buyer in Anton "Tony" Hulman Jr. and in late 1945, he and Wilbur negotiated with Capt. Rickenbacker for purchase of the Speedway. It would take a miracle to get the Speedway ready for a race that was a short 7 months away - the Speedway was in terrible condition and all the logistics in preparing for and running the race had to be completed in that time. 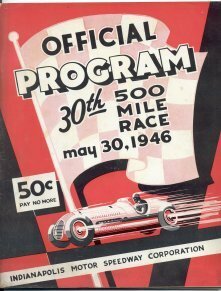 On May 30th 1946, Tony and Wilbur were pleasantly surprised by the record traffic jam trying to enter the Speedway - they had pulled off a miracle as the 30th running of the Indianapolis 500 Mile Race was a success. The program for 1946 retains the same size as 1941 at 8 1/2" x 11" and remains this size through 1955. The price raises to 50 cents in 1946 which would also stay the same through 1955. There are no pages numbers to 1946 through 1952 programs. 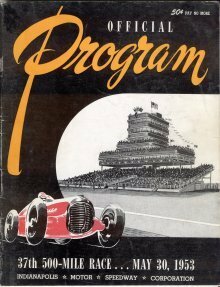 The cover to the 1946 program is predominantly red and black with black and white lettering and a speeding car below a waving checkered flag. The insert retains the same size and format as the 1941 and does so through 1955. 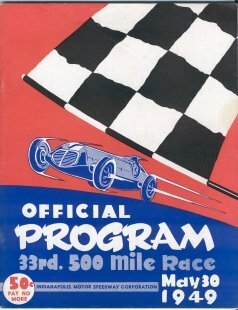 For 1947, the program color is blue and gray with white accents. The Pagoda is at center with cars racing past on the front straight. 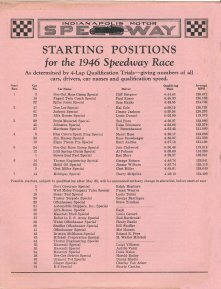 1948 is one of the cooler looking programs the Speedway has ever produced. Predominantly green and dark purple with primarily white lettering, a car reminiscent of a Novi or Blue Crown is speeding from right to left. 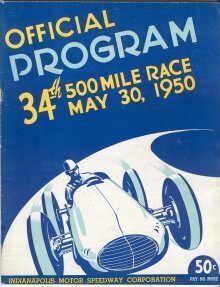 The 1949 program is similar to 1946 with its car under a checkered flag, but the color on the cover is split with red on the top two-thirds and blue to the bottom third. 1950 is again one of the cooler covers with yet again a car very reminiscent of a Novi or a Blue Crown heading right for you. It is predominantly blue and white with yellow and light blue writing. 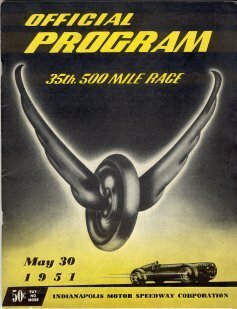 1951 is one of the more drab programs with it's yellow and black colors and gray wing and wheel at center and car at bottom right. 1952 brightens with green and white the main colors with yellow writing. It depicts two cars racing past the main straight stands with a checkered flag at right. 1953 is predominantly black with white and orange writing and a red racer at lower left. At right center is an artist conception of the "new" tower and stands that were in the Speedways future. Pages numbers re-appear in 1953 and are present through 1955. 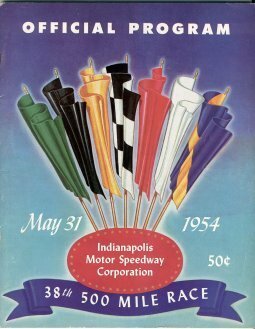 1954 is one of the more colorful Indy programs with shades of blue for a background color with racing flags coming out of a red oval at center with a dark blue banner below the oval. This is the first year for the flag motif to be used on the cover. The phrase "Pay No More" is dropped after appearing on the cover since 1922. For 1955, the cover changes to all white with the flag motif at center returning but the famous wing and wheel logo now appears with the flag sticks behind it. Orange and black writing are used. All programs through 1975 are basically the same design with the major exceptions being 1961 and 1966. Programs from the post war era begin to be easier to find. The toughest is the 1948 with 1950 right behind (1950 programs with inserts and no rain damage are valued a bit more) followed by 53, 52 and 49 with 46, 47, 51, 54 and 55 all about equal.